The NFL has been attracted to coach Kelly because of his commitment to an up-tempo offense that everyone can see as being difficult upon his foes. Yet a factor in some of his victories has been his propensity to change-up his game plan for the opposing defensive coaching staff. How can you defend something well if you haven’t prepared for it? Most Oregon fans notice the most obvious elements of our wins, but the “next-level” Duck fans that come to FishDuck.com want to learn a little more and see what Chip did, for example, to help secure a win in a second consecutive BCS bowl game. 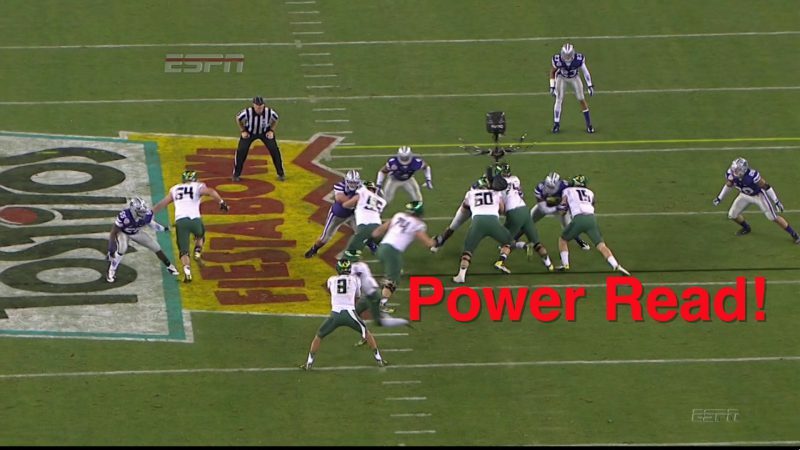 Let’s take a look at the “Power-Read” play as a nasty complement to our basic offense and how it could create indecision on the part of Kansas State. We line up early in the game with our old Outside Zone Read formation (above), where you see the RB parallel to the QB, ready to run the mesh going to our left. While we still run it on occasion, it seemed strange to have it in a BCS game. Would you look at that? We ARE running an Outside Zone Read (above), only instead of reading the DE on the backside…it is on the playside like a Veer? Wow, and Marcus has his hands full making sure that since the DE is “sitting” that he hands off. It was a good judgment by Mariota as DeAnthony Thomas blew to the outside for a nice twelve yard first down! For a play pulled out of mothballs…pretty good! It also messes up the decision rules of the defenders. 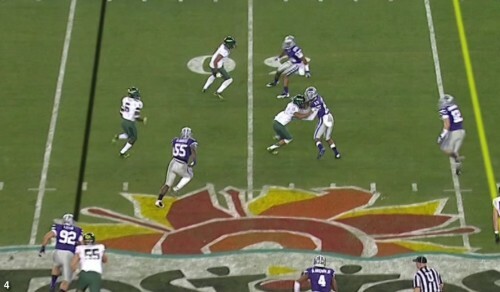 A pulling guard does NOT always mean a Power Play now and that creates hesitation with the Kansas State defense. Normally I cover two subjects in a Fish Report analysis, but this report was an “extra” analysis, as our usual report will come out this Tuesday as always. 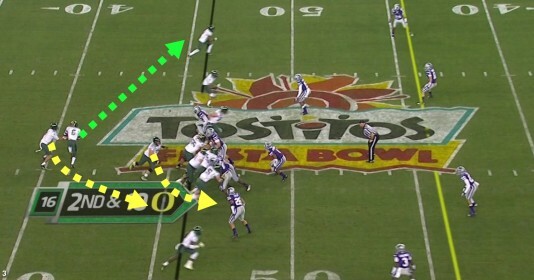 I saw that Chip used this in an earlier game and then pulled it out for the bowl game to help our running game. His game plan adjustment was not a complete transformation of the offense as we saw in the National Championship Game; but instead, a “tweak” that was minor to practice for, yet effective enough to disrupt the prepared defensive strategy of the Wildcats. If this was Chip’s last twist of a game plan, then it was a fun change-up to see immediately. At FishDuck.com, we have spent an enormous amount of time studying and learning about the hidden components of the Chip Kelly Spread Offense. We believe that just as this site has been a pioneer for fan websites in analyzing a particular college team, we also admit to the attraction of watching Chip’s progress with analysis and study at an NFL team-if he should depart. 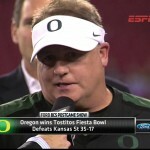 Here at Oregon the fascination will continue, as we will learn from the next coach as we did from Chip Kelly. It might be a ton of fun to see the Spread Offense from a different perspective and expand our football knowledge as we examine closely the future victories of our beloved Ducks. This has been a very rewarding two seasons and while we can’t wait to see what the future holds, we know we will enjoy the next new path we embark upon.